In the dead of night, an eggplant-shaped alien descends from a spaceship onto an unsuspecting town. In a New York restaurant, Lady Liberty herself feeds cheeseburgers into a machine, which emerge from the other end as perfect, crispy spring rolls. A menacing Emperor levitates stir-fry ingredients, and ornate boats bearing bundles of scallion, black beans, and eggs gently float past sesame-seed mountains. 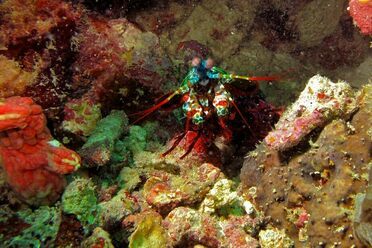 These scenes sound like the reveries of a psychedelic-laced imagination. But they come from the pages of The Illustrated Wok, a new print collection of hand-illustrated Chinese recipes from 40 chefs around the world. The book pairs each chef with an artist who produces striking and frequently surreal interpretations of the recipe. The prompt for the book was a wave of new restaurants and chefs taking a fresh approach to Chinese cuisine. Chow, Jager, and White wanted to showcase this innovation, and they drew inspiration from They Draw and Cook—a massive collection of recipe art. Several recipes in The Illustrated Wok particularly show how migration and local adaptations have produced distinctive Chinese food, including Korean, Indian, and even Israeli variations. Chef Doron Wong’s recipe for cheeseburger spring rolls could only have been invented in the United States, says Chow, or, more specifically, the melting pot that is New York City. Similarly, chef Javier Miyasato in Lima riffs on the Taiwanese guabao (steamed bun slider) using chicharrón and ceviche. Richard Hales’s General Tso’s Gator riffs on the Chinese-American (well, more American than Chinese) staple General Tso’s Chicken. The Miami-based Hales noticed that his seafood supplier offered alligator tail, so he put a locavore twist on the dish. In the dish’s entry in The Illustrated Wok, the creature winds its menacing way across a swamp dotted with orange trees. While some recipes are the chefs’ creations, other fusions have a long history: Chinese-Hawaiian gau gee dumplings have been around for over a century. The artists had just as much fun as the chefs. 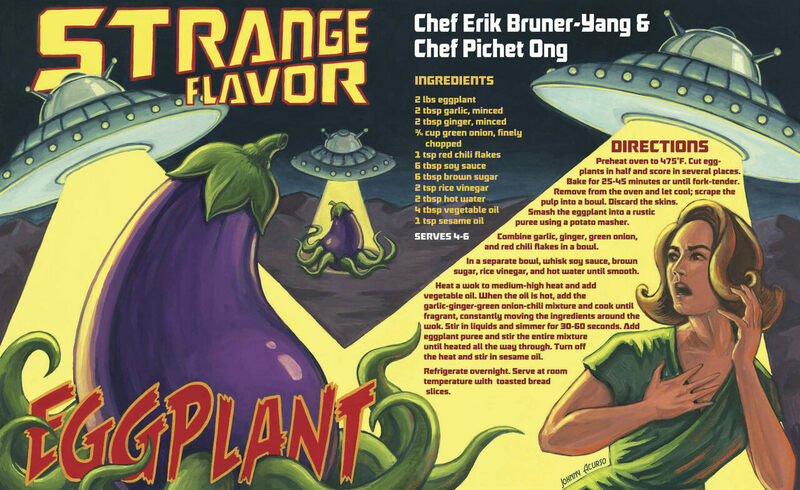 Illustrator Johnny Acurso reimagined Strange Flavor Eggplant—a complex Sichuan dish that literally translates to “oddly flavored eggplant”—as an alien invasion. Slightly Fires the Emperor is a dish named after a Chinglish translation of a Hakka stir-fry. The Chinese character representing the word “emperor” actually means “grand” when used in the context of a dish, which inspired “a giant hegemon being swarmed by ingredients and using Cyclops-style eye-beams or Iron Man palm blasts to fight them off.” Illustrator Denis Freitas tweaked this idea, turning the protagonist into “more of a Doctor Strange or Magneto who manipulates objects in mid-air.” The meal itself bursts with pork, squid, and garlic chives.